A 45 cm floppy plushie of Homer the fox for Lortsky, finished and shipped last December. This is a really big plush, about as large as I can make them at the moment! 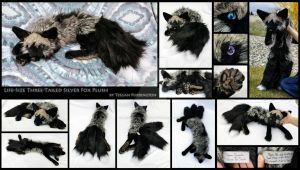 I really loved the tail, which is made up of 4 different furs which made this realistic gradient (and it is so soft!). 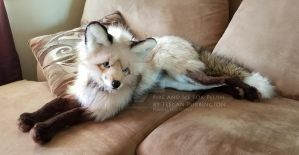 I used a combination of tipped realistic faux furs and minky. He has plastic safety eyes and a plastic nose. Shading was applied with Copic markers and he has a bag with plastic pellets in his belly and paws for extra weight. Thanks to his size Homer is very floppy and poseable, as you can see in the pictures. Getting a location to shoot was tricky though, he is bigger than my paper backdrops so I had to improvise ^^ I'll use this again for future large plush. I'm so behind on making and posting these photos (and other art) I'm going to try and catch up this month so be prepared for a lot of submissions! Wauw zo'n grote plush is ook echt super gaaf! Kleinere hebben zo'n hun charmes, maar zo'n grote is gewoon, tja, knuffelbaar haha. Dank je Jaa zo'n grote is echt heel knuffelbaar idd, ik vind het ook altijd lastig om ze weg te sturen als ze klaar zijn :') Het is ook een leuke afwisseling op de gebruikelijke kleine maatjes, maar het is wel echt veel meer werk en materiaal haha. Ja snap ik! Ik zou alles willen houden denk ik. 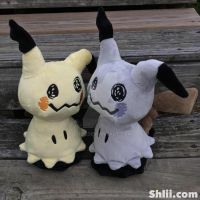 Jaa echt super gaaf om zo'n grote custom plush te hebben!